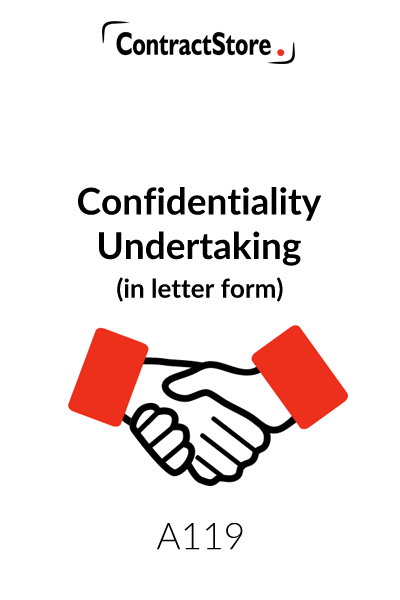 Who can use this Confidentiality Undertaking Letter? You need this document if you are a company looking to develop a product owned by another party, and want to maintain the confidentiality of information exchanged. What is this Confidentiality Undertaking for? 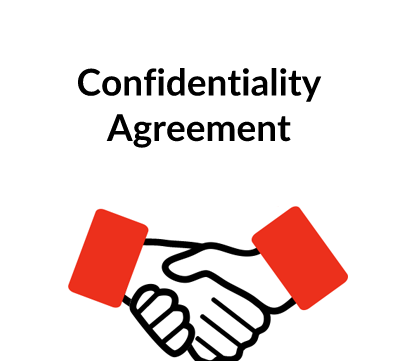 This Confidentiality Undertaking Letter is an agreement in the form of a short letter from a company interested in developing a product that the recipient of the letter has brought to it. The company makes a promise that it will keep all discussions regarding the new product confidential during a specified period. They will then either enter into a development agreement or bring the discussions to an end and return all confidential data. The recipient is asked to accept the terms by signing and returning a copy of the letter. What does this Confidentiality Undertaking Letter cover? This Confidentiality Undertaking is in the form of a short letter from a company interested in developing a product that the addressee of the letter has brought to it. For more information on each of these paragraphs, see our Explanatory Notes below. You will also receive a copy of them when you download the document from our website. An agreement can be in the form of a letter. When the letter is accepted and signed by the other party, it is an effective binding agreement just as a more formal agreement between Party A and Party B would be. A letter agreement is more user-friendly than an agreement written in the third person. Yes. You can buy it once and use it in your business whenever you need it. All ContractStore’s templates are in MS Word. You can issue it on your company letterhead as well as alter, or add to it, if you need some special terms. 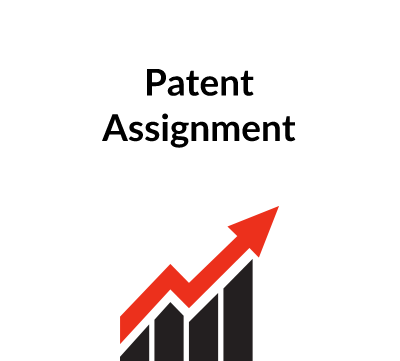 This Agreement, in the form of a letter, is designed for use by a company which is approached by someone with an idea for a new product. Confidentiality is usually in the interests of both parties in such a situation. While the letter deals with the key issues concerning confidentiality, the tone of the letter is fairly informal compared to our document A105. In paragraph 1, the obligation of strict confidentiality is imposed and the first sentence also makes it clear that both parties will be open with each other with regard to the information to be provided. Both parties are obliged to restrict access to the confidential information to persons who need access to it. Such persons are to be subject to obligations of confidentiality similar to those as set out in this letter. In paragraph 2 the Company sets a time limit within which it will decide whether or not to proceed with the development, and during that period the other party is required not to open negotiations with anyone else. The time limit can be extended by agreement. 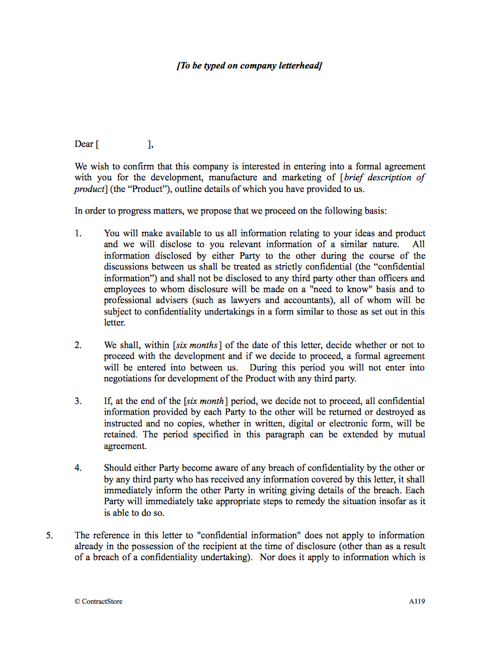 Under paragraph 3, if negotiations are broken off at the end of the specified period, all confidential information provided by each party must be returned to the other or destroyed. Paragraph 4 obliges either party to tell the other of any breach of the terms of the Agreement, This is important as it allows the party whose confidential information has been misused to take action to protect its interests as soon as possible. Paragraph 5 makes it clear that information which gets into the public arena is not covered by the confidentiality obligations unless this is due to some breach of a confidentiality undertaking. Similarly, neither party will be held to be in beach of their obligations if they disclose confidential information where ordered to by the courts or a relevant regulatory authority. Paragraph 6 specifies that English law governs the agreement created by this letter and any disputes will be finally settled by the English courts. This paragraph may, of course, need to be altered if the party sending the letter is in a jurisdiction other than England. While the letter deals with the key issues concerning confidentiality, the tone of this letter is fairly informal compared to our document A105.